In our Bhakti/Kundalini classes, workshops and retreats, we explore the inward journey of awakening and becoming fully alive through various yogic practices: pranayama (conscious breathing), mantra (healing sound), kriya (intentional action), gentle asana & body movement, meditation, and kirtan. KIRTAN is the ancient practice of chanting/singing sacred mantras. Kindling this loving inner connection helps us surrender into expansive states of awareness and blissfulness … our true nature. Through our longing & intention (Bhakti Yoga), we will learn and explore potent mantras & practices (Kundalini Tantra) that connect us to inner wholeness: human & divine, masculine & feminine. Consciously cultivating healthy love lives, with ourselves, with the Earth and all elements, with each other, with our partners & lovers, with the Divine and everyday existence, makes this life, just as it is, a true blessing. Our time together includes connecting with inner Creative Energies that infuse our lives with pleasure, curiosity, & inspiration. Daily life requires so much mundane maintenance and upkeep that we easily forget to call on the pleasurable aspects that can become dormant and blocked within us. Past psychological & physical trauma can also add to stagnation of energy. When awakened and activated, those Energies provide us with inspiration to open more deeply into our own nature/being and transmit throughout our daily living. We all have our own unique sound. Sound & music/melody & rhythm, are unifying forces that can dissolve separating or binding energies and help us feel more connected to ourselves and each other. We receive and practice with potent, directly transmitted mantras, that come from an alive lineage through my teacher Sally Kempton, and her teachers of the Kashmir Shaivism tradition; Swami Muktananda. We sit, ask, and listen inside for our own unique practice to emerge. Learning to soften and relax into the tension of opposites and wait for a third thing to arise. Movement & playful meditations also included. As we access and cultivate the inner nectar (amrit/rasa), the juice that hydrates, irradiates, and opens us into the space of grace, we develop an increasing capacity to digest, assimilate, and integrate both the light and dark into our lives. Becoming more conscious of how we push away negative and undesirable feelings and emotions, (i.e. : shame, jealousy, discomfort, fear, grief/loss, self-doubt, anxiety, anger, irritation), we can begin to gently invite, include, and integrate them which, with practice, becomes our healing journey into wholeness. These classes, workshops, & retreats are for those adventurers that long for full-spectrum life experience by increasing their capacity for true intimacy and freedom, joy and sorrow, pleasure and pain. This event has passed, but enter your email to be notified when the retreat will be held again. 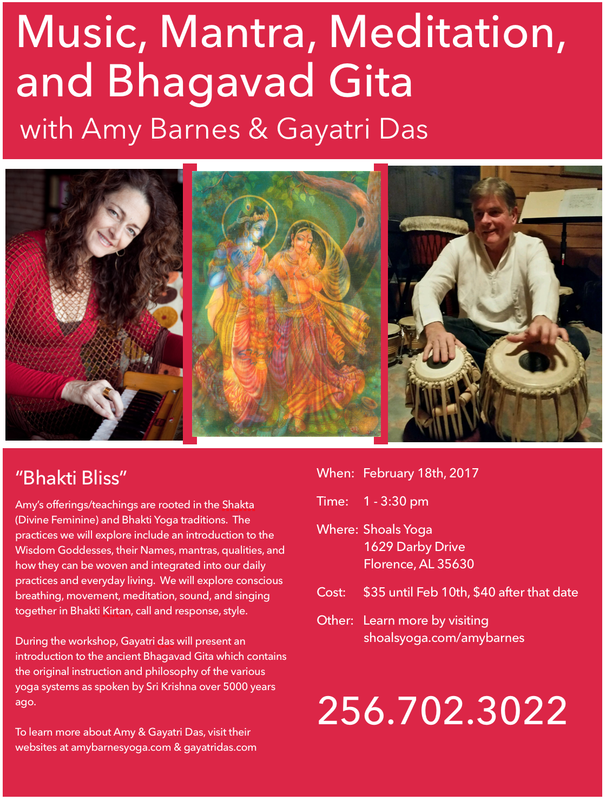 These classes are open to EVERYONE, no previous music or yoga experience is necessary. The techniques & practices offered are centered around opening the heart. Interested in attending more workshops and classes? Visit my Events page to see what’s coming soon. 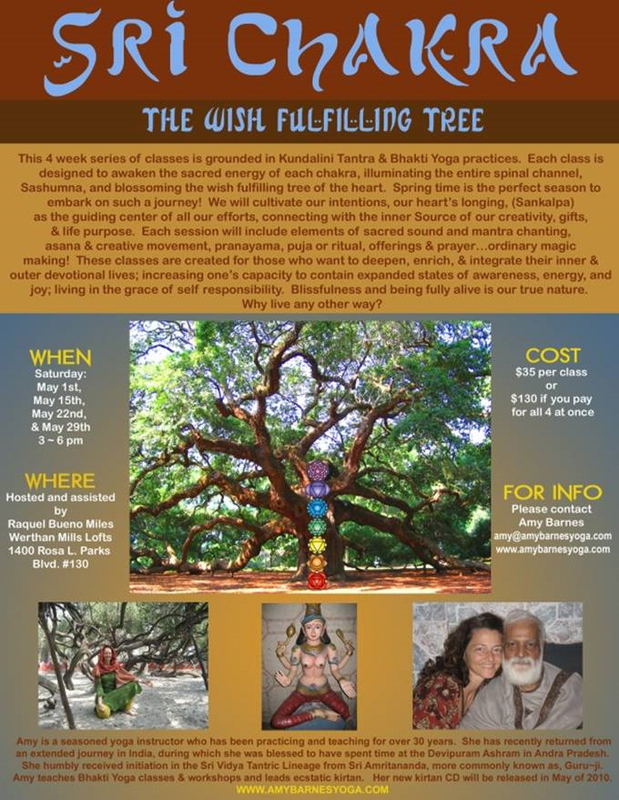 Sri Chakra ~ the Wish Fulfilling Tree class offering is grounded in Kundalini Tantra & Bhakti Yoga practices. Each session is designed to awaken the sacred energy of each chakra, illuminating the entire spinal channel, Sashumna, and blossoming the wish fulfilling tree of the heart. We will cultivate our intentions, our heart’s longing, (Sankalpa) as the guiding center of all our efforts, connecting with the inner Source of our creativity, gifts, & life purpose. Each session will include elements of sacred sound and mantra chanting, asana & creative movement, kriya, pranayama, puja/ritual, offerings & prayer… ordinary magic making! These classes are created for those who want to deepen, enrich, & integrate their inner & outer devotional lives; increasing one’s capacity to contain expansive states of awareness, energy, and joy; living in the grace of self responsibility. Blissfulness and being fully alive is our true nature. Why live any other way? Want to be contacted when this class is held again? O Uddhava, neither Yoga, nor Knowledge, nor Dharma, nor study of the Vedas, nor austerity nor renunciation propitiates Me or wins Me, so much as unswerving devotion to Me. I, the beloved Atman, am attained only by undivided devotion and faith. How can the mind be purified without devotion to Me which is characterized by melting of the heart, the hair standing on end and tears of joy trickling down the cheeks? A devotee of mine whose speech is broken by sobs, whose heart melts, who without shyness weeps profusely, or laughs or sings loudly and dances, not only purifies himself but purifies the whole world! Just as gold blown in the fire loses it’s impurities and regains it’s real form, so also the mind shakes off it’s impurities and it’s tendencies of Karma and desire by means of devotion to Me, and attaining to Me, regains it’s own true form. The more the mind is purified by listening to my sacred stories and the repetition of My names, the more it sees the subtle essence of things and the subtle Reality. Therefore, think of Me and your mind an d heart will be merged in Me alone! For Sri Caitanya and his followers, Bhakti is the ultimate aesthetic experience, or rasa, which is beauty and joy eclipsing all other emotions. The Bhakti~Yoga, the spiritual path of love and devotion, revolves around the cultivation of ecstatic self~surrender, yielding the graceful gift of rasa (nectar). The walls have crumbled and the heart stands naked before the Beloved, whose sweetness (madhurya) knows no end. Liberation in love is not mere isolation from the drama of ephemeral existence (samsara) but freedom from the ego~personality and the empowerment to participate consciously and ecstatically in the eternal lila (play) of the divine. The liberated devotee does rest content with reaching the summit of spiritual practice but, seeing the divine in all beings and things, happily returns to the valley of life to bear witness to the supernatural beauty in everything. In a way, he or she never leaves the valley but discovers the summit of spirituality amidst daily life: love melts down the distinction between sacred and profane, and in full bloom can be at least as potent a mind~harnessing tool as conventional yogic meditation. In love, all the energies of the soul are focused into a single laser beam that reaches across the gap between the artificial boundaries of the intellect, uniting the devotee’s heart with the ever~pulsing heart of the Beloved.